You know all those jokes about herding cats? Well, here is a true story about training a cat. 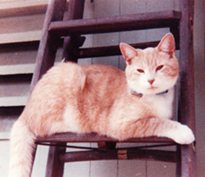 In only 15 minutes, Dr. Bourget trained a cat to go backward down a steep loft ladder, so he would stop going down forward and falling on his head. Even though he looked "cool", after he fell on his head, she could not take it and vowed to make this trip safer. After she trained him, he went down backward from that day forward, and never fell on his head again. If she can do this, imagine what she can do for your company! From Old Power to New Power: Which Leaders Will Survive? Do you understand the real underlying cause of the economic crash, i.e. how power was used? Do you know how to do a "Turnaround Without Tears" In your company? Do you know how to unleash huge profits hidden in your company, even in tough times? Do you know how Old Power puts your career and company at risk? Do you understand why CEOs are losing their jobs in unprecedented numbers? Leaders are losing power. How can you gain more power with less risk? How do you know if you have the Power Shift blues? "The ideas are brilliant. The clarity is brilliant. This book is a turning point. It is unique. No other leadership book deals with these issues in one...package. She has a rare combination of intuitive...uplifting thinking and a practical focus, and simplifies the complex so that action steps are clear. It reminds me of a favorite quote from Oliver Wendell Holmes, 'I would not give a fig for the simplicity this side of complexity, but I would lay my life down for the simplicity after complexity.' The applications...are very powerful." From foreword by Warren Bennis, Distinguished Professor of Business, University of Southern California, author 28 leadership books, including Geeks and Geezers, and Judgment: How Winning Leaders Make Great Calls, his latest. "Dr. Linne Bourget is the female personification of the Dalai Lama. She has remarkable talents, gifts and attributes which uniquely position her to effect world change. I have had the opportunity to meet many famous and powerful "World Leaders" over the course of my life, and while that is always a special opportunity, it is even more rare to meet a true "World Changer". Dr. Linne, with her work on leadership power, has the capacity to effect world change." A 2011 study shows 84% of employees are ready to leave their jobs! Do you know how to prevent this loss and keep your best employees? Do you understand the real underlying cause of the economic crash and what you must know to recover and thrive with minimum risk? Do you know how to lead Change without Tears or "Turnarounds without Tears"? Do you know how to unleash innovation and profits hidden in your company? Do you understand why CEOs are losing their jobs in unprecedented numbers? Why leaders are losing power? How can you gain more positive power for more profit and less risk? The One Master Key - The Global Power Shift. From foreword by Warren Bennis…”Brilliant ideas…brilliant clarity…unique...a turning point...results-driven.” Dr. Warren Bennis, Distinguished Professor of Business, University of Southern California, author/co-author of 30 leadership books. Bill Bartmann, author, Billionaire Secrets to Success, says “Dr. Linne Bourget is the female personification of the Dalai Lama, a true “World Changer”. In author’s own voice. 5 hrs. 5 CDs only $69.95. What's Really Stopping You from Keeping Top Talent and Implementing Greatness- & Strengths-Based Change for Fast Turnarounds in a Tough Economy? Every leader knows change is the toughest part of your job, especially in tough times. Do you know the secret ignition key to faster, easier, better change? This manual gives you the road-tested Engine and 4 Wheels positive powerful practical Strengths-based Leadership Language System for great change. You can be the hero/shero in your company! Results include: 1. Financial results improved 35-40%, fast! 2. From not being able even to sell great systems to internal customers to selling internally, externally and setting the national industry standard. 3. Creating a national action plan in three days after squabbling for years. "Dr. Linne Bourget is one of the most experienced and reflective practitioners in the field of - change leadership. She knows her stuff, inside out. On top of that, this book incarnates her ideas with energy, clarity, and reader-friendly application." Dr. Warren Bennis, Distinguished Professor of Business, University of Southern California, author/co-author of 27 leadership books, including On Becoming a Leader, Organizing Genius and Geeks and Geezers. "Words have power to maximize your results and this positive book shows how to do it instantly!" Mark Victor Hansen, Co-creator, #1 New York Times best-selling series Chicken Soup for the Soul® and Co-author, The One Minute Millionaire. 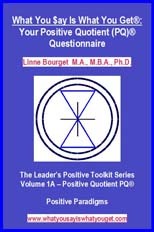 By Dr. Linne Bourget M.A., M.B.A., Ph.D.
What is Really Stopping You from Keeping Top Talent and Implementing Greatness- & Strengths-Based Change for Fast Turnarounds in a Tough Economy? Financial results improved 35-40%, fast! Client not even able to sell great systems to internal customers to selling internally, externally and setting national industry standard. In author’s own voice, 5 CDs, 5hrs. only $69.95. Can You Pass This Leadership Test? What Every Leader Needs To Know About the Profit Power of a Positive Culture Research shows: Companies with a higher ratio of positive to negative statements are more profitable! How positive is your culture? If I observed your meetings, how many of your statements would be positive? Negative? If I interviewed your employees and customers, how would they rate you? Positive or negative? In all of your tasks as a leader, how positively do you and all executives and managers in your company lead, work and communicate? Can You Pass This Leadership Test? What Every Leader Needs to Know About Profitable Strengths-Based Business Companies with a higher Appreciative Quotient(AQ) are more profitable and keep great talent, lowering turnover costs. How about yours? If I interviewed your employees, how appreciative would they say you are? How effectively do you and all leaders in your company identify and appreciate strengths and use them fully in every aspect of your business? Let Your "Present"� Transform Your Future - How to get from where you are now to where you want to be in your marriage! Don't let economic pressures ruin your marriage!! Did you know that a bad marriage can ruin your life, career, health and wallet, and spread upset to those around you? A print shop employee said: "You can tell immediately if someone has a bad marriage when they come in here." It's that obvious! 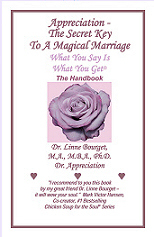 Giving this present for your own marriage or friends' marriages will transform your future. This lovely gift book gives you an appreciation handbook from the leading appreciation expert, based on over 25 years of experience. How Does Appreciating Each Other Strengthen Your Marriage? Huge Benefits! What Happens to Your Marriage without Appreciation? A Huge Risk! Quik Quiz - How High Is Your Marital Appreciation Quotient(AQ)Â®? Do you know why all children and teens are at risk, not just the disadvantaged ones?? Clients asked for this book, but I didn't finish it until my nephew was offered drugs in the bathroom in middle school! What he said is priceless and if your kids say it, it will strengthen them hugely! It's in this audio book! Every day children are exposed to risks and dangers we did not imagine when we were growing up. How can you protect your children and prepare them for a great life? Along with information and values, the only inoculation is your psychology! Only children with incredibly strong self-esteem can stand among bad influences and stay strong enough to do the right thing. They can only do this if you teach them their greatness and strengths, so they know who they are. They can only do this if they know you see their highest and best strengths. This can only be done with highly skillful genuine appreciation - you have to know what you are doing! Parents told me they had no time to read, so here is your 2CD audio book! Carefully crafted to listen to in your car with your kids in the back seat listening. 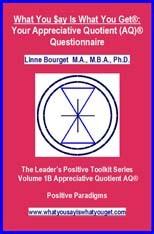 It includes your Quik Quiz to find out your parental Appreciative Quotient(AQ)®! 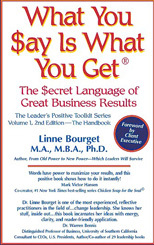 "I recommend to you What You Say Is What You Get® by my great friend Dr. Linne Bourget. If you want better results, listen to her book! Recorded by the Author herself, a professional enthusiastic speaker! Only $24.95. New books and training/coaching systems on the Future of Leadership Power and the Master Intuition System for Leaders, as well as articles and other systems in the What You Say Is What You Get"® product line. First and foremost, our work is not an add-on program that replaces any of your initiatives. Rather, our integrated systems make achieving your goals and everything you do faster, easier and more successful. As corporate futurists, we are national thought leaders and content experts, creating unique, leading edge FAST (Frameworks, Attitudes, Systems, Tools) roads for better, easier, faster results. Services for Leaders, Consultants, Coaches - We have a Passion for the Practical! Got Power? Our Content Expertise is delivered in speeches, strategy sessions, consultation, and integrated learning sessions for executive teams and consultants and trainers who can train others, with a license for our materials. Only consultants and trainers certified by ITLC are qualified to deliver this unique, powerful combination of text. We offer Power Check-ups, to discover where your leaders are in the Power Shift and what they need to understand and learn to make the Power Shift. What are the major dangers, demands, lessons about power and forms of New Power your leaders need to understand and develop to survive at the speed of the Idea Economy? How well prepared are leaders in your firm to make the Power Shift quickly and seamlessly? This includes systems for vision work, planning, hiring, leading change, culture fit, delegation, communication for transformation, leadership transitions, and crises, feedback, teams and meetings, problem-solving, startups, endings, downsizing with less employee downtime, rapid organizational crisis healing and more, all honed by client feedback for over 25 years. How well does your company measure up in using New Power consistently and well? Developed in the early 1980s specifically for practical applications in all aspects of your business and built out from over 100,000 applications. How many leaders in your firm have reliable accurate intuition for business decisions? "Without power, without the engine, your car goes nowhere. A senior executive team hires Dr. Bourget to for a keynote speech or an interactive speech/think tank discussion, working across eight fields of knowledge. They then receive training in the Power Shift, and New Power One and Two. 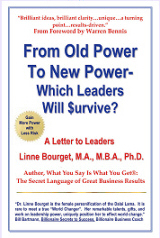 Dr. Bourget trains other senior executives in the firm in Power One and Power Two. Dr. Bourget offers intuitive strategy sessions for senior executives in change/direction of the business/product development/R&D, etc., adding massive value to your firm. We train your internal trainers and license them to use our training systems for Power One and Power Two to train managers, supervisors and key staff. All sessions have follow-up events built into the agreement, to strengthen practical application, a key part of our commitment to clients. Repetition is essential for learning to "take". Dr. Bourget consults with you behind the scenes with a limited range of text, especially helpful for more challenging projects. She will also work with your clients only in the areas described above. We help you strengthen all you do with your clients. Can you imagine the value of working with a positive business leadership expert who can see the future of your company and help you strategize the fastest way there, based on your greatness? That could be worth millions of dollars! System 2: Your Greatness and Strengths-Investment: (Required) Know your best so you can build your business on the best foundation. System 3: Inner Team Works--Deepening Your Connection to Your Strengths and Greatness (Optional) Very helpful if you are a stranger to your strengths. System 4:Choosing Among Alternatives--Your Optimal Business Focus (only required if you need help choosing among different possibilities). System 5: Unique Positioning Strategy Points Your greatness/strengths gives you the basis for a powerful market position-leave your competitors behind. System 6: Intuitive Strategy Evaluation & Foresight Investment: (Systems 2 & 5 required prior to this System.) Dr. Linne looks at your strategy and evaluates it intuitively from her expertise as a 4th-generation intuitive and creator of the Master Intuition System in 1980. System 7: Positive Leadership Strategies and Skills for You and Your Team. May include Myers-Briggs, positive strengths-based planning, delegation, meetings, startups, endings, roles and responsibilities, establishing positive cultures, mergers, acquisitions, challenging change, and more. System 8: Wellness/Fitness/Energy/Stamina Creating positive energy to support you as a positive leader. Exhausted leaders cannot create positive cultures. We will offer training and certification for external trainers, coaches and consultants. We will be developing new products in the Old Power New Power and What You Say Is What You Get® product lines for licensed use by companies, trainers and consultants. Customize approaches to fit your unique leadership style and organization's culture and strengths. We believe in the power of your strengths and help you leverage them for profit. Treat you with profound respect and appreciation, focusing on your strengths and what you do well. Even the toughest issues are resolved with strengths-based systems. Prefer to transfer our expertise to you and your employees, via strengths-based accelerated learning, rather than keeping you dependent on us. Integrate what we teach with your real work in the learning sessions. Provide confidentiality for all clients, anonymity option available. Bring the powerful precepts and practices of quality to every project.